Helen Kara’s new book explores the messy realities of research and emerging, creative opportunities. Sarah Lewthwaite finds Creative Research Methods in the Social Sciences a reflexive, dialogic book that demands active reading. As a creative text for students and teachers, the book is designed to enable and support, rather than prescribe. The book looks at the breadth of innovative research practices and is ideal for those seeking to gain a broad sense of this dynamic field. Creative Research Methods in the Social Sciences: A Practical Guide. Helen Kara. Policy Press. April 2015. Research methods present a particular challenge for academic authors. As Bourdieu (1992: 222) observes, the realities of social research methods require ‘a pedagogy which is completely different from that suited to the teaching of knowledge’. Overreliance on knowledge transmission can lead to ‘an idealised and misleading picture of the research process […] which ignores the messy and uncertain reality’ (Hammersley, 2012). 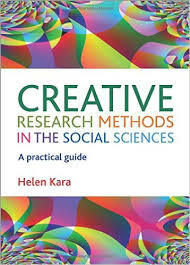 Helen Kara’s new book Creative Research Methods in the Social Sciences: A Practical Guide actively seeks to meet this challenge. Its explicit focus on creative methods practice is matched with an acute awareness of the need to disrupt any tendency towards empiricist foundationalism and the ‘facts’ of research practice. Kara foregrounds uncertainty in a refreshingly open and accessible introduction to an expressive and enriching field. Kara observes that ‘uncertainty is closely linked with creativity’ (Grishin 2008:115, and others), and there is a delicate balance to be struck between generic principles and the situated perspectives that advanced methods demand. To this end, Creative Research Methods delivers early chapters focussed on notions of creativity, approaches to creative thinking, the relation between creativity and ethics. The methods discussion introduces arts-based research methods, research using technology and mixed-methods research as particular streams of innovation and interest. Across these and ensuing chapters, Kara maintains an emphasis on contextual decision-making; she highlights key research decisions necessary to any project, whilst gesturing to alternative approaches and discourses that might supply ways forward or issues for consideration. In this sense, Creative Research Methods is a reflexive, dialogic book that demands active reading. As a creative text for students and teachers, the book is designed to enable and support, rather than prescribe. Creative Research Methods also maintains an overt connection to the messy realities of research. In the research methods classroom, this is frequently expressed in emphasis on apprenticeship, student-centred and experiential learning, authentic involvement, tacit knowledge and learning-by-doing (Kilburn, Nind and Wiles, 2014). To the same end, Kara punctuates her book with an intricate patchwork of dozens of carefully selected examples, vignettes and case studies that give the text a rich and ‘thick’ feel, connecting the reader to a wealth of literature. Chapters on ‘gathering data’ and ‘analysing data’ introduce and demonstrate a myriad of approaches and techniques. Methods such as focus groups, diary method and photo-elicitation, are given fresh insight and advanced and niche approaches such as use of ‘grey’ literature, critical communication methodology (CCM), ethnotheatre, crystallisation, Open Space Technology, bricolage and re-mix (to name a few) are introduced. The book moves easily through visual analysis, data integration, drawing, mapping, shadowing, vignettes, personal history and time-based analysis practices amongst others. A landscape of creative analysis from screenplay writing, poems, photographs and diagrammatic metaphors is clearly drawn, with a powerful cumulative effect. Amongst cross-cutting themes, arts-based research methods are most vividly engaged and given space to inspire. Technology-enhanced and digital methods are not as clearly depicted in creative terms as other themed areas (mixed-methods, participatory and emancipatory, and transformative methodologies). Kara quotes Gangadharbatla (2010: 225) to observe that ‘Technology itself has an influence on people’s creativity, yet the role of technology in the creative process has not yet been fully understood or theorised’. This may neglect what some disciplines say about how new technologies relate to innovative socio-cultural practices with direct implications for research methods. At the risk of reviewing the book I wanted to read, rather than the book Kara set out to write – I would have welcomed a larger discussion of technology and innovation in the development creative methods. Following analysis sections, chapter 7 ‘Writing for Research’ focuses on writing within research as a creative act – from reflexive writing strategies within the research process (through journals, blogs and devices such as I-poems) to a dissection of authorial ‘voice’ in its active and passive form at the level of the text, or showcasing opportunities to develop narrative modes of qualitative reporting such as screenplays, memoir, poetry and prose. Kara moves to examine research ‘presentation’ in chapter 8. This is usefully framed with a strong ethical dimension and attention to emotional impact amongst other critical issues. Ethnodrama, graphic novels, pantomime, stand-up comedy, props, and multi-media amongst others are discussed in applied terms. However, given the burgeoning world of data visualisation, I had hoped to see more dynamic use of images in this section – there is a discussion on the presentation of quantitative data that works as a basic primer, but there is less space given to #dataviz. Where culturegrams, schematic diagrams, photo-essay, dance and infographics are mentioned, they are not visually illustrated. This gap in the text could have been mitigated using online media, indeed, where links to video, blogs, podcasts and other relevant multi-media are available, an icon is shown in the margin. These icons are scattered across the book. However, whilst they do indicate the availability of online resources, the system employed is counter-intuitive. Where the icons appear, there are no links, and at times searchable terms appear to have been removed. This leads to occasional bland statements as readers are unhelpfully funnelled through the companion website to resources that are otherwise public and directly, available. For example, ‘A video about photo-elicitation can be viewed online’ (p85) refers to a YouTube film by Rao, Jackowitz and Miller, which in turn draws on Loeffler (2004). A name, title or link would allow readers to get straight to relevant content. This is a surprisingly obtuse aspect of a book that is otherwise generous and accessible in its style and approach. Links, QR codes, or even the direct, if historic, style of referencing that academic papers are granted would have served this content better. The website itself will be a welcome resource for teachers and students of creative research methods, however, for readers who want to engage quickly with the supra-text, this gatekeeper mode of delivery turns the companion website from an optional resource into a necessary hurdle. Creative Research Methods in the Social Sciences opens a window onto some of the most innovative contemporary social research practices. It will reward active readers, new scholars, researchers and those seeking to gain a sense of this dynamic field. The book reflexively chooses breadth over depth, and in doing so provides an accessible route into more challenging terrain.